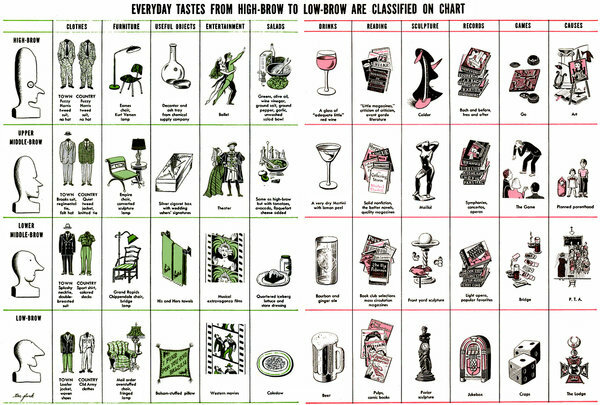 Few charts deserve a page one feature article in The New York Times Arts and Leisure section, but pop sociologist Russell Lymes’ classic 1949 delineation of “highbrow,” “middlebrow” and “lowbrow” tastes has been “reproduced and imitated countless times,” the Times reports (see Go Spotting: The “High-Brow” Game and An Unlikely Place 6/19/2014 EJ). 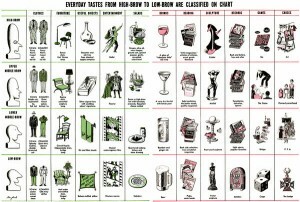 Russell suggest typical preferences for each group in various categories, such as clothing, reading, favorite causes — and games. To see how go placed, click here.